Gentrification is something we as Montrealers have been talking about for a long time. From the Plateau many years ago, to Saint-Henri and Hochelaga more recently, to Pointe-Saint-Charles in the near future, as each new neighbourhood undergoes this drastic social and economic change, we have an opportunity to reflect on the many facets of the issue. It’s a complex topic and, thanks to the city’s ever expanding borders and notoriously poor urban planning, an often-inevitable phenomenon. We’ve seen the effects of gentrification in New York, Vancouver and lately, Toronto; rents skyrocket, low-income families are pushed further away from the city instead of given the opportunity to join the development, and, if it continues, the city centre runs the risk of emptying out. In many ways, gentrification is a process that is often racist and sexist. One example is Little Burgundy, a historically Black area of Montreal east of Saint-Henri that underwent serious redevelopment at the hands of the city in the 60s. 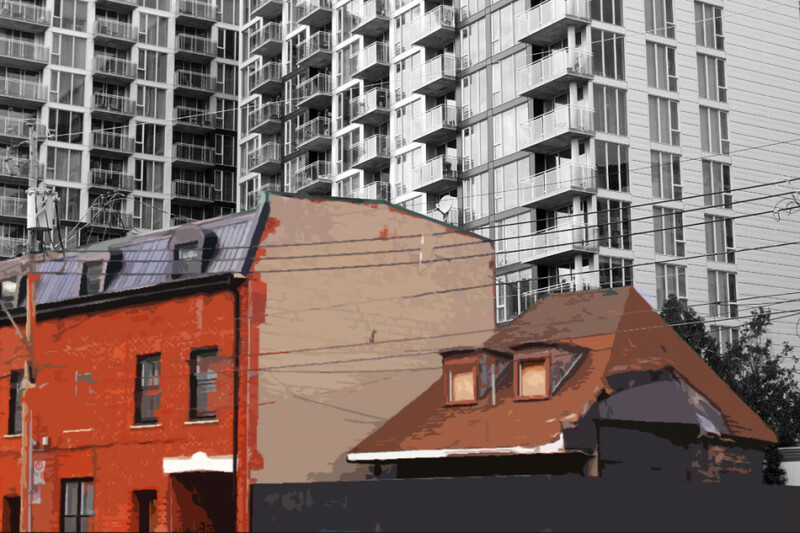 Gentrification ensued, displacing a large part of the neighbourhood’s prominent Black community as middle-class, mostly white families settled into newly built or renovated homes. In 2011, over half the population of Little Burgundy was white, while 18 per cent was Black. In Pointe-Saint-Charles in 2011, single-parent families made up almost half of all families in the neighbourhood. Single mothers head most of these families with many of them living beneath the poverty line—37 per cent of individuals in the area are low-income. As well, single-parent families have the lowest average salary. As Pointe-Saint-Charles continues to develop, single mothers will likely be under the most pressure to seek out lower rent further away from the city. In this way, gentrification tends to have more of an impact on women in the area. But is gentrification the only way to develop a neighbourhood? Must the revitalization of an area be aggressively detrimental to the residents of that community? Many would argue that no, it doesn’t need to be. What if, when we start to see more of a social and economic development in a neighbourhood, we promoted balance and diversity? What if we strove for an area where low-income homes and high-income homes were right across the street from each other, creating a better social cohesion and less ghettoization of rich and poor? Businesses could diversify; casse croûtes could coexist with upscale Asian fusion restaurants. Rents would stabilize. Low-income residents would have the chance to participate in the economy of the area. To minimize the effects of gentrification as much as possible, this is the type of development we should be striving for. However, it might get more difficult for us citizens to have a voice. A proposed provincial bill drafted with the goal of giving municipalities more authority in urban planning would effectively remove what little authority residents have in the matter. As it stands, residents can call a referendum on zoning changes for projects if enough signatures are collected—usually only the signatures of those living in the immediate vicinity of the site count. It is only after a referendum is called that consultations can be held by the Office de consultation publique de Montreal, an independent organization tasked with obtaining public opinion on projects. An amendment in the proposed Bill 122 would abolish citizens’ right to call a referendum on projects that are of concern to them. Mayor Denis Coderre, who supports the bill, has gone on the record as saying that the public will still be able to participate in the planning of the project through consultations. Critics of the bill, though, have pointed out that without the right to call referendums, citizens cannot call for a consultation by the Office de consultation publique de Montreal on their own. It will therefore be up to city administration and the developers of a project to call for consultations, something that causes concern to those who oppose the bill. After all, in a city known for being rife with corruption—just look at the Charbonneau commission—it’s easy to see how this exchange of power from citizens to private construction companies and municipal administration is worrisome to many, especially since it pertains to citizens having the opportunity to have their voices heard. We’ve seen citizen referendums in action in the past. In 2015, developers scrapped a proposed plan to construct a Provigo grocery storye in Notre-Dame-de-Grace after residents had collected enough signatures for a referendum. After already dealing with an influx of cars with the construction of the McGill University Health Centre, they were concerned that their area could not support any increased traffic the project would cause, which also included several floors of condos above the store. Clearly, this bill would directly facilitate the gentrification of a neighbourhood. When a major condo development or plans for a chain grocery store is planned in a historically working class area, residents will have no way to ensure their voices are heard—whether or not the city will schedule consultations to hear what they have to say about a project that could have repercussions for them and their neighbourhood is completely out of their hands. Without the possibility of a referendum, citizens lose the ability to ensure that the development of their area occurs on their terms. Historically, the city has not been concerned with curbing the gentrification of an area and assuring a more diverse and balanced development takes place—development that is inclusive and doesn’t discriminate. Removing our right to call a referendum will only reinforce this stance and make the residents of developing areas even more powerless in the struggle to protect their neighbourhood. It’s time Montreal considers a different approach to urban planning—one that does not push low income people further away in favor of the middle class, but one that promotes balance and inclusion for all regardless of income. Bill 122’s amendment abolishing the right to call a referendum is a big step in the wrong direction.